I recently was making a little trip to the suburbs of Toronto and had a few minutes to spare before getting on the bus. Since I was at Union Station, I decided to stop at the much talked about Union Market. I’ve often passed it while walking around the area but this is the first time I went through the stalls. It was a hot and sunny Saturday afternoon in the city so am ice cream stand naturally caught. An ice cold sweet treat was sure to be delightful relief. As I walked up to investigate, I noticed the stand had vegan selections clearly highlighted… I was instantly sold. After discussing options for sizes and flavours, the guy behind the glass had sold me a pint of a flavour I wasn’t even considering. 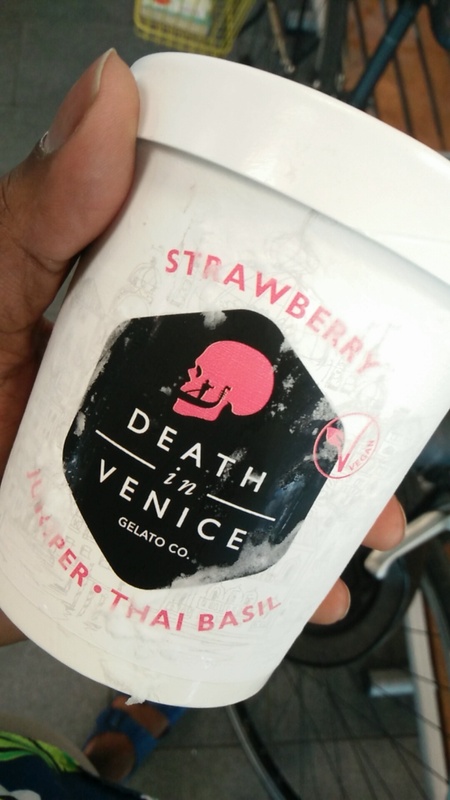 The name of the stall/company was Death in Venice Gelato. I ended up choosing a sorbet of strawberry, juniper and Thai basil. I had it with my friends later that day for a post BBQ dessert. It was well received and I thoroughly enjoyed it. We made some lemon coconut cookies, and it was a great compliment to the sorbet. From the first bite you can tell that it’s 100% real fruit. The berries were as decadent as eating the real fruit. The Thai basil was an interesting twist to add in as well. I think it gave the sorbet that “je ne sais quoi” factor that makes new foods memorable. The basil was a good balance between pungent and polite. You could tell it was in there but didn’t stop the other tastes from coming through. I will say that this wasn’t the best sorbet I’ve ever tasted. I think mint would have been a better choice than Thai basil. However, I am a lot more interested in the brand and trying their other flavours. Since the kitchen is my laboratory, experimenting with dishes is a common occurrence for me. Last week I decided to play around a bit and do something new with some sweet potatoes I bought. Usually I would bake or fry them, but that particular day I felt like having mash potatoes. In true Darrell fashion, my brain started wandering and thought of what else I could have with it. I raided my fridge and decided to add a carrot I chopped up and froze last month plus a half can of cooked lentils from the previous week. When thinking of what flavours/spices to use, sweet potato pie came to mind and provided some comfort food type inspiration. I became pleased with this train of thought and started putting everything together. The end result came out way better than expected! I was not only pleasantly surprised, I went in for seconds and thirds. If it were a song, it would be 2 Legit 2 Quit by MC Hammer. I got a positive response after posting a picture of it on IG. 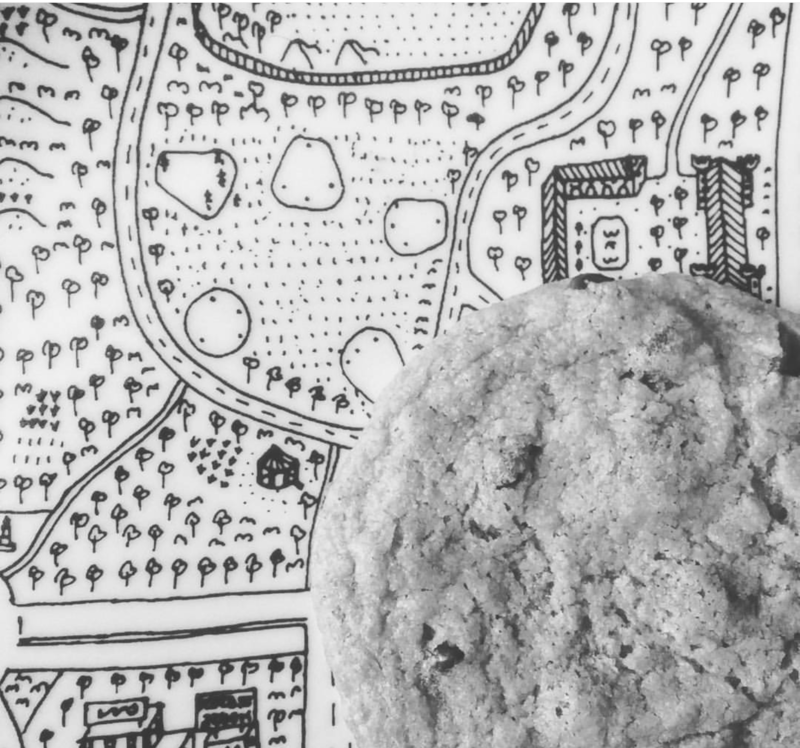 I even had a few people say they were interested in the recipe (little did they know I didn’t use one…). So in an effort to remember what I did and share it, here’s a post with the recipe! 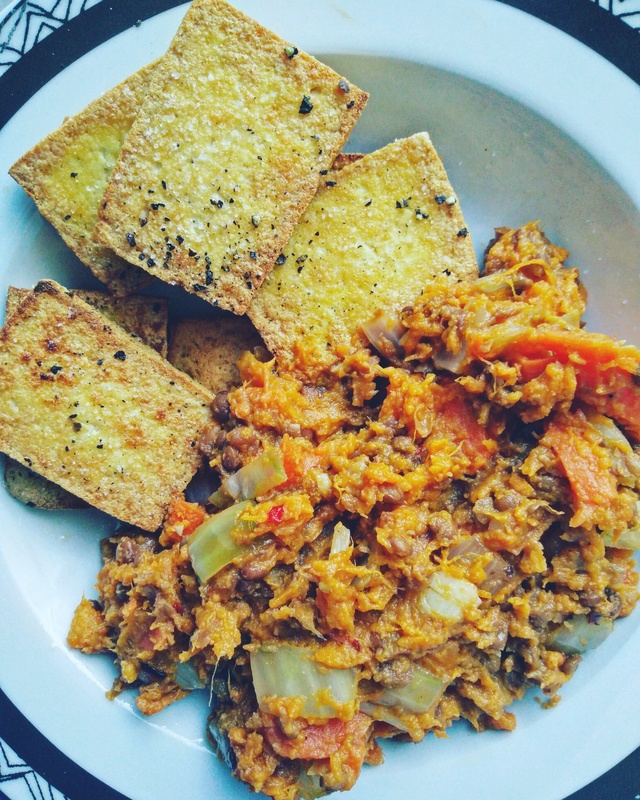 Fried tofu with sweet potato and lentil mash. 1) Chop 2 sweet potatoes and 1 carrot. Boil until very tender and then strain. 2) While the vegetables boil, sautée half an onion diced and 3-5 cloves garlic minced. I personally love garlic so feel free to add like 8 cloves, I won’t judge. Once a nice golden-brown colour, set aside. 4) Add about 2 tbsp vegan butter to the sweet potatoes & carrots plus 1-2 tsp each of cinnamon/nutmeg/all spice/chilli powder. Mix & mash together! 5) Add cooked onions, garlic and lentils to the sweet potato mixture. Mash some more! *I like my mash chunky, I think the different textures keeps things interesting. If you want a smoother/creamier mixture, slowly add more vegan butter and a bit of soy milk until you get the consistency you like. *When it comes to spices, we all like different things… I personally used 2 tsp cinnamon & chilli powder, 1 tsp nutmeg and all spice. Feel free to use more, less, or none at all. You can add or use different spices that you like (rosemary and thyme are good ones too). It doesn’t feel like 3.5 years have past but that’s when I first started my vegan life. I spent most of December 2013 and January 2014 watching documentaries about food and it really got me thinking about what was on my plate and going into my body. It wasn’t just all slaughterhouse documentaries. I grew up in a family where food was very important culturally, but somehow over the years it lost it’s importance on me. I was eating a lot of processed foods and had no idea what was on my plate or how it even made it’s way there. What was the story behind this meal? I think that question is how veganism made its way into my life. The more I thought about the “story” of my food, the more I didn’t want to have formerly living animals on my plate. Some vegans have labelled this as becoming conscious of your choices. By the end of that January, I made up my mind that the only way I could be truly satisfied with my meals and food choices was to become a vegan. At that time, I was also getting ready to move into my first “big boy” apartment so it was nice to have this change also be part of my new beginnings. The last week in January while finishing packing my belongings, I made a little outline for how I would start this vegan journey. I did research a bit into it and also watched even more documentaries about it. Some people may see a vegan diet & lifestyle as restrictive but that couldn’t be further from the truth. I was making a willing and positive change to my lifestyle and I think this also helped with my thought process along the way (and shut down the skeptics). Over the course of February, I was going to eliminate one type of meat from my diet and would be eating fully vegan by the end of the month. I also allowed myself one non-vegan meal per day but tried to eat vegan whenever possible. I decided to make it a point when buying groceries to buy only vegan items. At the start, the hardest part wasn’t actually trying to eat vegan, it was more so trying to blocking out the negative feedback from family and friends. Suddenly everyone cared and had an opinion about what I was eating. I truly believe that becoming a vegan made be more resilient to negative. At the same, to be going against the norm and eating food that made me feel good was empowering. I began to win over family and friends when they noticed that my food was not bland and had plenty of colour and variety. 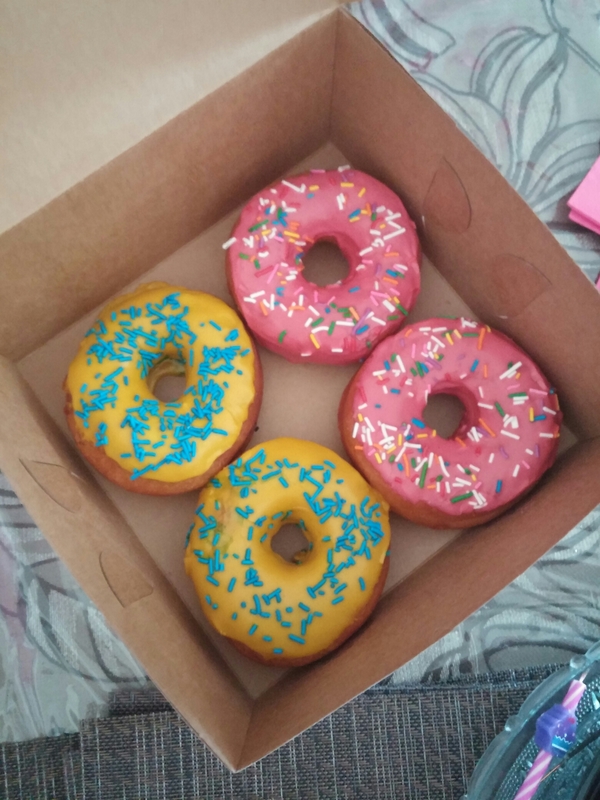 I was also still able to indulge in my food favourites such as cupcakes, cookies, ice cream and chips in a vegan way. There are also so many “accidentally vegan” foods around that most people don’t even recognise that they are eating vegan food. My vegan path has changed quite a bit compared to when I started 3 and a half years ago. I have posted over 100 photos to Instagram using my hashtag #cookingwithdoryane in an effort to document the foods I personally make. I also have hosted plenty of family dinners and holiday parties for friends featuring a fully vegan and down right delicious menu. It’s also been exciting to see new vegan friendly spots in Toronto and exploring some of the older ones I didn’t know existed. If I were to give advice to a new vegan, the veg-curious and omnivores would be this: you do you. It’s your decision what gets put on your plate and goes into your body… at least it should be. I never try to push “vegan propaganda” onto my loved ones, but at the same time they’ve come to an understanding that they should not push a pro-meat stance onto me. I’ve made myself open to questions and answer them as positively as I can to the best of my abilities because I know that I would want that person to make an informed decision too… even if it ends up that that still consume animal products. It’s also important to say that adopting a vegan lifestyle may not be for everyone. Culture, social pressures, accessibility, food security, lifestyle… these are all major factors that influence someone’s diet and no one should be shamed for choosing and having what they do. Let me just start by saying vegans can love pizza too! It’s true that I do not eat dairy products out of personal choice. 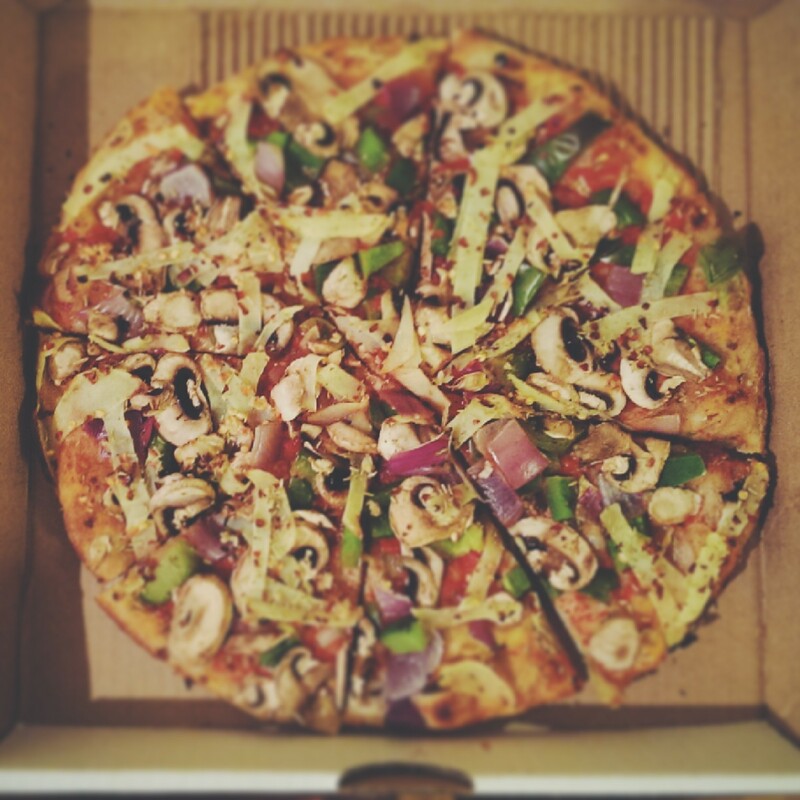 And some people think not having cheese on pizza is not pizza but meh… works for me (and many other vegans). This pizza is from Pizzaolo. It’s topped with so many veggies, garlic olive oil (instead of tomato sauce) and no cheese. So delish! I’ve been thinking a lot about tofu lately. Since I’m a vegan and not allergic to soy, I eat tofu all the time. That being said, I never actually sat down and thought about tofu until now. Because the typical North American diet does not contain tofu in its many glorious forms, most people just view it as a white tasteless block and are not a fan. But! I’m a firm believer that tofu can taste amazing all the time. Most often, the person preparing the tofu has not done anything except chop it up and put it on top of a salad which is instantly unsatisfying. So, here is a post with some of my tried and true tofu tips. I often make tofu dishes and find that these simple things can take your kitchen cred to the next level. 1) use the good stuff: Soy is the one the top genetically modified crops in the entire world. If you haven’t heard the term GMO, I strongly encourage you to read up on it! Look for tofu that says ‘non-GMO’ on the label. 2) check the firmness: The firmness is almost always labelled on the pack for tofu. Medium-Firm is a good all-around choice and absorbing spices/marinades. Firm is great for being grilled or BBQ’d. Extra/Super firm is perfect for frying (my favourite). The soft and silky tofus are best saved for desserts and baking. 3) press your tofu: Wrap the tofu in a few pieces of paper towel, place on a plate, and put a bowl on top for about 10-15 minutes. Instead of using paper towel, you can also use a cheese cloth. Another super cool and nerdy way is putting the tofu in hot and heavily salted water (osmosis!). Having tofu with the water squeezed out from it makes a big difference. Tofu is like a sponge, so pressing out the water means it will now better soak up whatever sauce or spices you use. It also makes tofu the perfect texture for frying. 4) SEASON IT! : It baffles me when how some people think it’s okay to serve and eat plain tofu. The power to absorb spices/sauces/rubs/marinades is definitely one of the top features of tofu. A few of my favourite combinations? 5) be creative: Some of my best food moments have featured tofu in a method or flavour I never would have expected until I tried it. A favourite of my friends & family is a chocolate cheesecake I made and is primarily made with silken tofu. 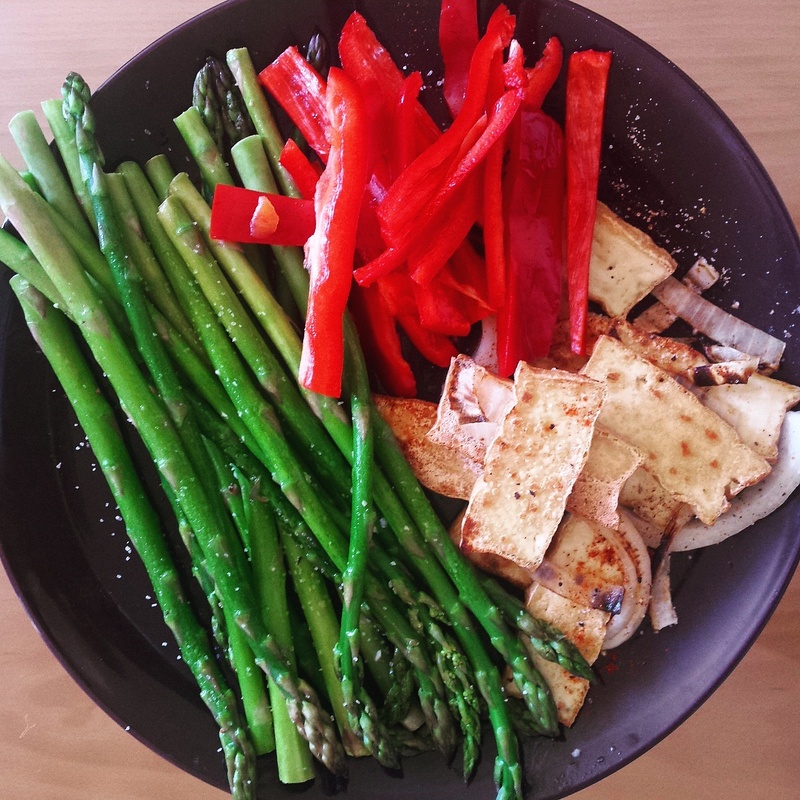 Fried tofu with asparagus and red peppers. Maybe be it’s stress from work & the holiday season, or the fact that I’ve been trying to eat better… but I had a super pregnant woman style craving for something sweet today. I bought chocolate chips yesterday in hope of baking cookies so I did just that. A few weeks ago I also stocked up on some ice cream because it was on sale. What a good match! I saved some of the chocolate chip cookie dough and out it on top of the dark chocolate truffle ice cream I had been saving. 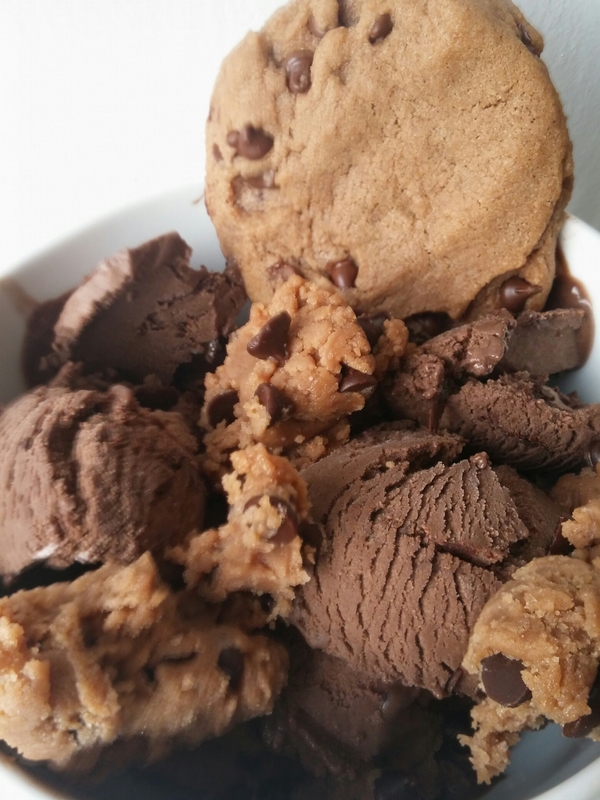 A freshly baked cookie added on top helped this become a true #treatyoself moment. Words cannot fully express how delicious (and needed!) this was. Most of my family and friends know that I’m not a big soda drinker. I prefer drinking tea or water and if I really want something sweet, I’ll drink juice. But there are always exceptions to the rule! I can’t remember when I came across Blue Sky, but I’ve loved it since I first tried it. I like that it uses cane sugar instead of glucose/fructose/artificial sweeteners. It really impacts the taste. Also, the flavours are pretty awesome. 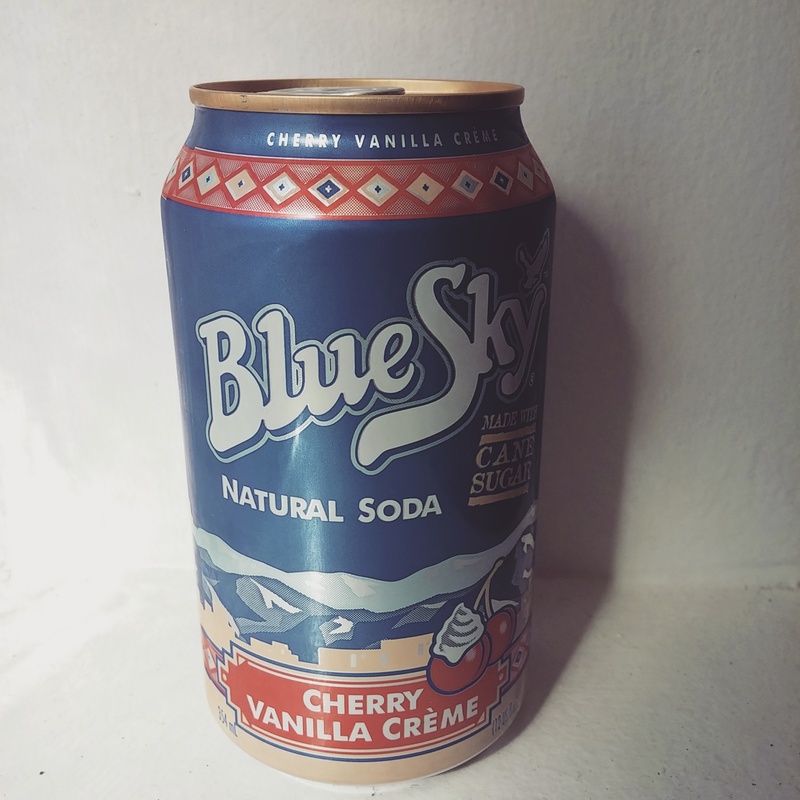 My favourite Cherry Vanilla Creme is a yummy take on creme soda. An honourable mention goes to their Jamaican ginger ale, made with real ginger so it still has some kick to it. If it’s been a long day or I simply want to treat myself, this has been my indulgence of choice lately. 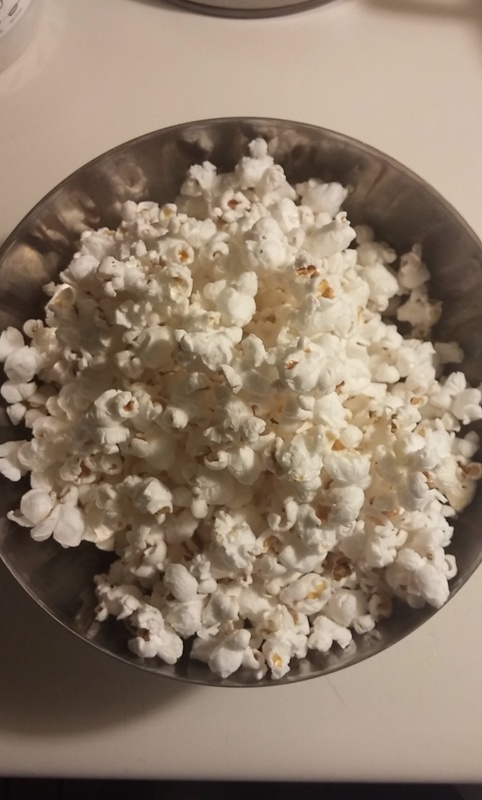 One of my favourite quick and easy snacks is popcorn. Before becoming a vegan, I rarely are popcorn. It was something I had at the movie theatre and even then, I didn’t always go for it. After becoming vegan and wanting a good salty/savoury alternative to chips, I discovered making my on stovetop popcorn. Making popcorn on the stove means I can make as much or as little as I want in one go. I can also flavour it however I want. – once you hear the kernels popping, start shaking the pot. this helps to prevent it from burning and will keep unpopped kernels at the bottom. – when you hear that the popping has stopped or significantly slowed down, the popcorn is done! The more I travel, the more I appreciate the vegan eating options Toronto has. Without a doubt, one of my favourites is the Apiecalypse Pizza and Snack bar. 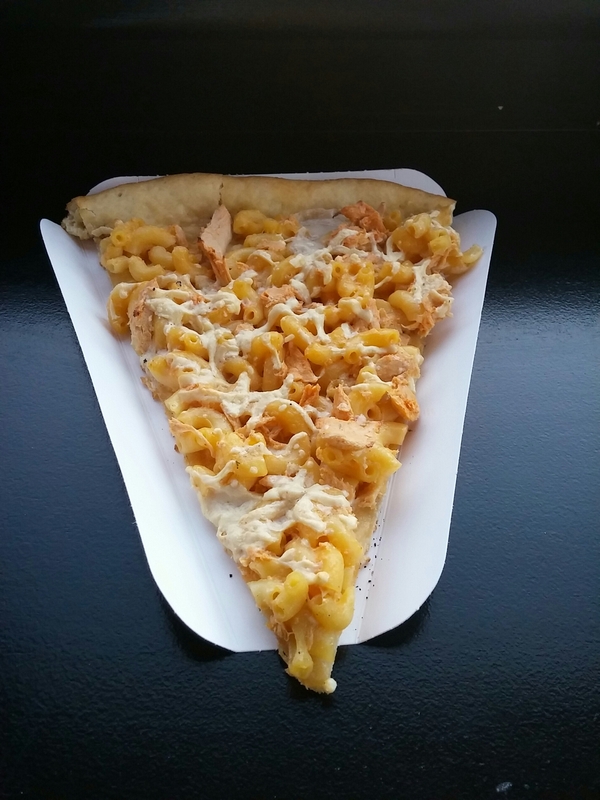 The Mac & Charlie pizza is the stuff dreams are made of and the donuts are some of the best in the city.